The Ritz-Carlton, Dove Mountain community stretches across some of the most exceptional land within Dove Mountain and includes The Ritz-Carlton Hotel and Spa, The Ritz-Carlton Residences and The Golf Club at Dove Mountain featuring 27 holes of Jack Nicklaus Signature golf. Designed with the easy-going elegance that defines southwest style, The Ritz-Carlton, Dove Mountain introduces you to the enchantment of the Sonoran Desert with beautifully appointed rooms, sumptuous meals, and luxurious spa treatments. The customizable single-family homes that make up The Ritz-Carlton Residences were planned to ensure gorgeous views and resort style living for every resident. Experience an award-winning new way to discover the true Southwest. The Ritz-Carlton, Dove Mountain Hotel & Spa holds the esteemed honors of the Forbes Five Star and AAA Five Diamond awards. 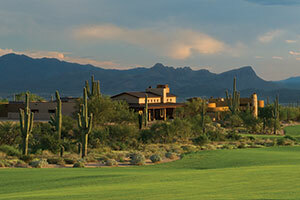 The Ritz-Carlton, Dove Mountain was inspired by its lush Sonoran Desert surroundings. The Arizona resort was created with a highly authentic sense of place with the presence of desert stone and metal. This celebration of Arizona’s geology can be seen in the resort’s natural quartzite floors, raw steel fixtures, copper accents, and historical desert artifacts, such as colorful geodes and quartz crystal. Interior carpets represent Arizona sunrises and sunsets, each bordered by the area’s majestic saguaro cactus. The strikingly beautiful saguaro grows nowhere else in the world, and the main building of the resort was situated to preserve decades-old saguaro cacti. With views of Jack Nicklaus Signature golf set among towering Saguaros, highly customized Residences offer a fluid series of indoor and outdoor spaces to be enjoyed year-round. Twenty custom estate homesites round out the real estate offering, and an award winning clubhouse complex provides a home base for residents and members. Despite close proximity to both Tucson and Phoenix, it’s easy to sense a profound connection to nature with the lush Palo Verdes, majestic Saguaro cactus and the untamed beauty of the Tortolita Mountains surrounding The Ritz-Carlton, Dove Mountain Community. Choose from eight customizable floor plans ranging from 2,000 to 5,500 square-feet or custom estate homesites ranging from 1 to 7 acres. Ownership includes access to The Ritz-Carlton hotel and spa, golf membership to the 45,000-square-foot Golf Club at Dove Mountain and 27 holes of Jack Nicklaus Signature Golf, private lush desert living and more than 50 miles of hiking, biking and walking trails.